Learn how to roast a chicken and make an amazing dinner at the same time. After tasting this delicious chicken with crispy skin and juicy meat you’re going to be putting this on the weekly menu. 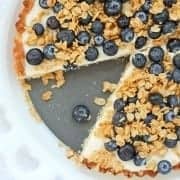 Hi all the amazing readers of the Rachel Cooks, Phi here, and I am so excited to be a guest contributor on Rachel Cooks. You may remember me from when I did one of Rachel’s ‘Day in the life’ posts where I shared all about how I spend my crazy days, so you already know that I love sharing how to make dinner time a little easier, which is exactly what I’m going to do today. Today I’m going to teach you how to roast a chicken. I tend to make roasted chicken on the weekends. I find it’s a really nice dish to prep and cook in the afternoon and then have ready for dinner. It also makes for some delicious leftovers (if there are any, because I guarantee everyone will love this). Thinking about the task at hand might be intimidating…what if it doesn’t turn out? I mean, it’s a whole chicken we’re talking about…just you and the raw chicken, I get it, it can be a little scary, but I’m here to walk you through it, so fear not! And while we’re at it, we’re going to make a complete and delicious meal, because there’s nothing worse than having one component of a meal but then needing to make something else. I’m all about making tasty dishes and meals without spending hours and hours in the kitchen. Although that is fun sometimes, I don’t know about you, but the majority of the time I like to spend time doing other things (like perhaps spending some quality time with family…or folding that laundry that has been piling up? Yeah I’ll take spending qt with family!) The beauty of this dish is that doesn’t take that long to prep or hands on time (about 10 minutes) and is one of those dishes that one can put together and then leave in the oven (while doing other afore mentioned other things). What we’re going to do is start bottom up, and by that I mean we’re going to start by prepping what goes at the bottom of the roasting pan and then work our way up to what goes on top…the chicken! You really don’t need a fancy pan, if you have a Dutch oven type roasting dish like the one I’m using, great, if not feel free to use any baking dish that you have (you can see in this post where I made a Whole Roasted Chicken with Lemon Garlic and Thyme that I roasted the chicken in a baking dish). So we’re going to start by cutting up some carrots and potatoes and then placing them at the bottom of the roasting pan or baking dish you’re using (you don’t need to peel the carrots, just cut off the ends and wash them, and likewise with the potatoes, just cut off the dark bits and leave the skin on). Nestle the carrots and potatoes at the bottom of the dish and the liberally season with salt and pepper. Next we’re going to prep the chicken. Make sure your hands are clean and you have a clean cutting board to work on. You’ll remove the little packet of innards and wash the chicken and then pat it try with paper towel. You’ll then create a butter-with-seasonings mixture that you’ll spread beneath the skin. Gently lift up the skin of the chicken and scoop the butter with a spoon and then put the spoon beneath the skin and press the butter mixture off onto the chicken by pressing on the top of the chicken. Massage it in from the top layer of skin. 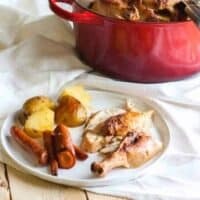 When you’re done you’ll place the chicken on top of the potatoes and carrots, then you’ll pour olive oil over the chicken, squeeze a half of a lemon over the chicken and then place that lemon into the cavity of the chicken, and season the chicken. You want to pour the oil over the chicken when it is on top of the vegetables because as the chicken is cooking-so will the vegetables! You’ll bake the chicken for an hour and then remove the roasting pan from the oven. 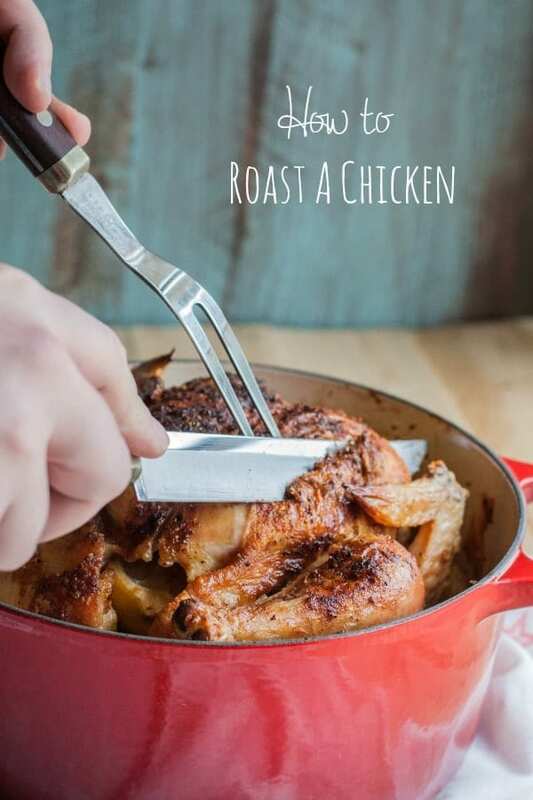 You’ll gently remove the chicken and place it on a cutting board and stir the vegetables, then place the chicken back in the roasting pan and then use a baster to baste the chicken with juices from the bottom of the pan. Then you’ll bake it for another half-hour to forty-five minutes, then remove the dish from the oven, allow it to cool for 10 minutes, and then you’ll cut the chicken and serve it with some vegetables. It makes for one delicious meal. See? Roasting a chicken is totally doable! If I can learn how to roast a chicken, trust me, you can too! Sometimes I’ve found that chickens come with their legs tied together, but if yours doesn’t (like the one that I used for this, it didn’t have its legs tied together) you could just leave them untied because they’ll be nestled in the bed of veggies, or you could use twine and tie them together (I don’t have twine just lying around, so I normally don’t do this step). And if you have any chicken for leftovers, you can make this Farro Salad with Chicken from Rachel, I have already made it more than once and can tell you that it is ammmmazing! Other good uses for this chicken would be chicken enchilada flatbread or chicken barley soup with kale and butternut squash. Start by prepping the potatoes and carrots. 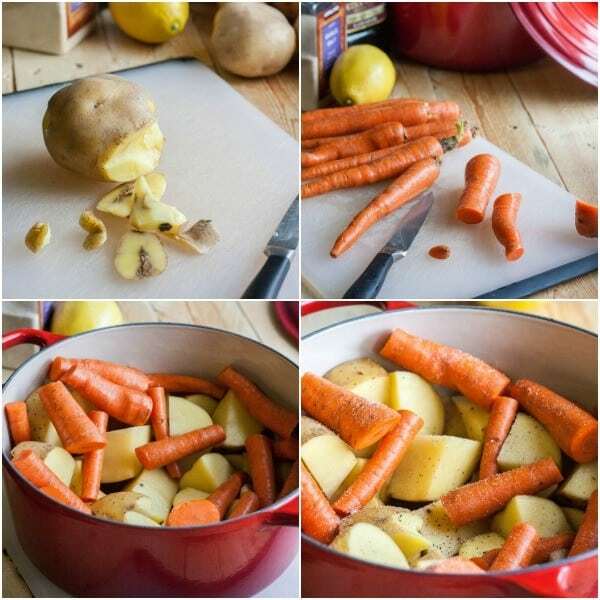 Wash the potatoes and carrot and remove any black spots from the potatoes and cut the potatoes into cubes, then cut the tips and bottoms from the carrots and cut them into chunks – about 6 per carrot. Place carrots and potatoes at the bottom of a roasting dish and liberally sprinkle salt and pepper over the vegetables. Now prepare the chicken. To do so start by removing the giblets packet, and wash and place on a clean cutting board. Pat dry with paper towel. In a little bowl combine 3 tablespoons butter, 1 teaspoon each of salt, pepper and garlic salt and 1 tablespoon paprika. Now gently lift up the skin of the chicken, and then with a spoon scoop some of the butter mixture and place it beneath the skin. From the outside of the chicken massage the butter off the spoon and onto the chicken. Make sure both breasts of the chicken are covered with the butter, and then if there is any leftover butter mixture massage it on the outside of the chicken. Place the whole chicken on top of the roasted vegetables. Squeeze half of a lemon over the chicken and then place the lemon inside the cavity of the chicken. Over the chicken and vegetables in the roasting pan pour 3-4 tablespoons olive oil. Sprinkle a little salt and pepper over the chicken, and place in the oven. 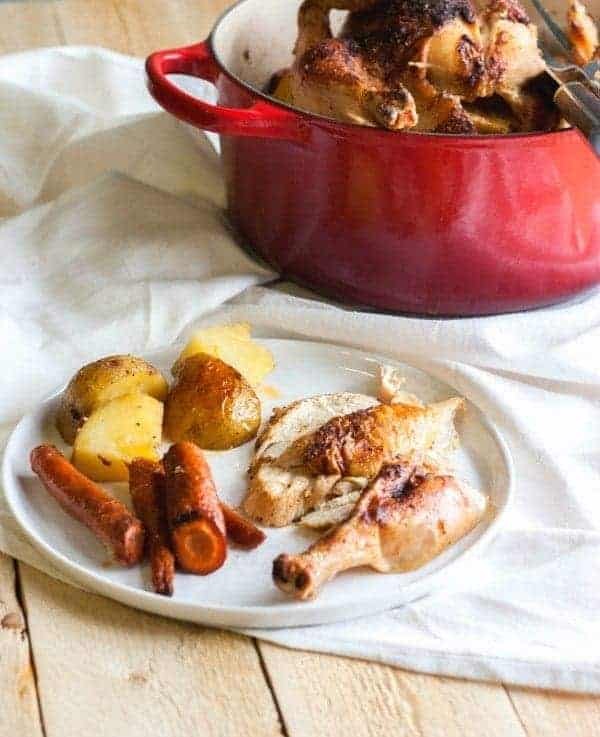 Bake for 50 minutes, then remove from oven, gently remove the chicken, stir the vegetables and place the chicken back onto the vegetables, then baste the chicken with the juices from the bottom of the pan. Bake the chicken for another 30 minutes (or until when the chicken is cut clear juices come out.) Remove the roasting pan from the oven and allow to cool for 10 minutes, then slice the chicken, and serve with potato and carrot slices. I hope you’ve learned how to roast chicken easily at home. I’ll be back next month, and if you’d like to see what I’m up to on my own blog in the meantime, you can visit me over at The Sweetphi Blog. 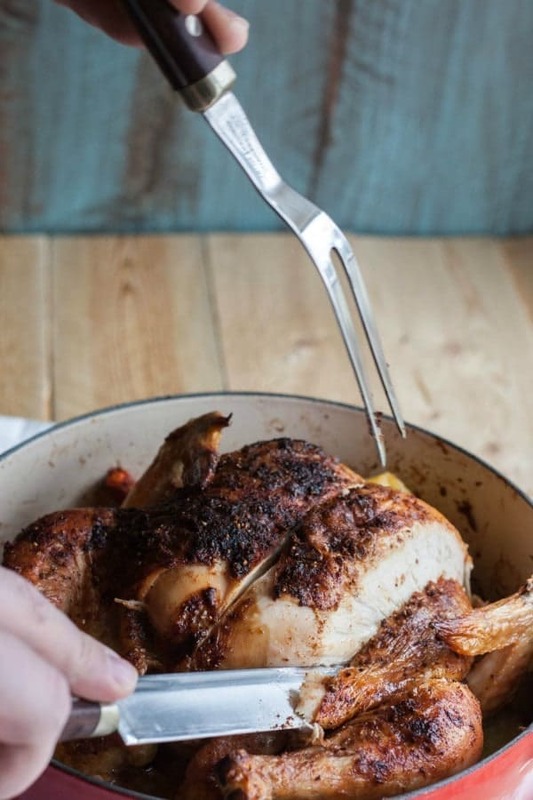 Hand over the fork and knife, ready to chow down on this delicious roasted chicken recipe! 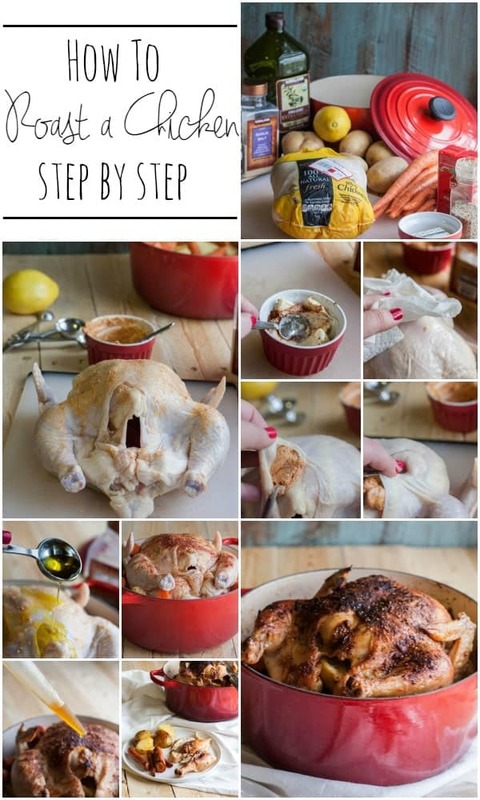 Great tips for making chicken perfection! 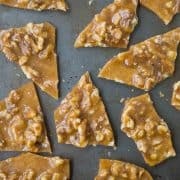 such and easy thing to make! love the seasoning you use! So excited to be a guest contributor Rachel! Hope you don’t get tired of hearing me say that lol, love how it all came together, and roasting a chicken is one of my favorite favorite favorite things to make!! The cook time is 80 minutes. You are right! 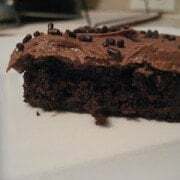 Thank you for catching that – I updated the recipe. Such a great post. I will admit, I never roast my own chicken. Such a shame really, I need to change that! My family would love it.